PowerBook G4 Aluminum 15 & 17 Inch - All models. Also compatible with all models that use A1036 45W Adapter. 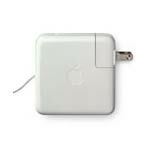 This used genuine Apple AC adapter is in good condition. It comes with the mini AC adapter as shown.